Dr. Jeffrey Suplica is a radiation oncologist based in Sacramento, California. He has an overall medical experience of 24 years. Dr. Suplica graduated in 1993 from the University of Maryland. Afterwards, he proceeded with his internship at St Mary's Hospital Medical Center. Then, he completed two residency programs at the University of Maryland and UCSF. Dr. Suplica is a board-certified specialist in Radiation Oncology. 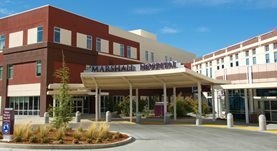 He is currently affiliated with the Marshall Medical Center in Placerville.